Poetry as Polaroid – Find You in the Sun – A daughter's slow waltz with her mother's dementia. Days when I am seated with Mom, a most extraordinary ordinary moment will occur such that I want to write an urgent message to the poetry gods. Usually, I am nowhere near a paper and pen. When she and I are not engrossed in activities or sun-worshipping or watching The Price is Right, when I am engaged in a singular, monumental moment of hers, I snap a photo of the scene in my mind. I inhale sterile smells, absorb dull colors, and listen for quiet sounds. I soak up words muttered around me, people circling nearby. I note wrinkled potatoes slumping on her plate or the candied clouds outside. I carry this image with me for hours, sometimes days, until the right words spill from my brain and onto the page. When this happens, a poem is birthed. I edit the poem little because I am simply describing the Polaroid in my head. I’ve used poetry in my life as a means of prayer, introduction, and connecting to the person inside of me I so badly want to be. But the most poignant, most healing and rewarding time spent writing poetry has been when I have captured my mother in her natural surrounds. 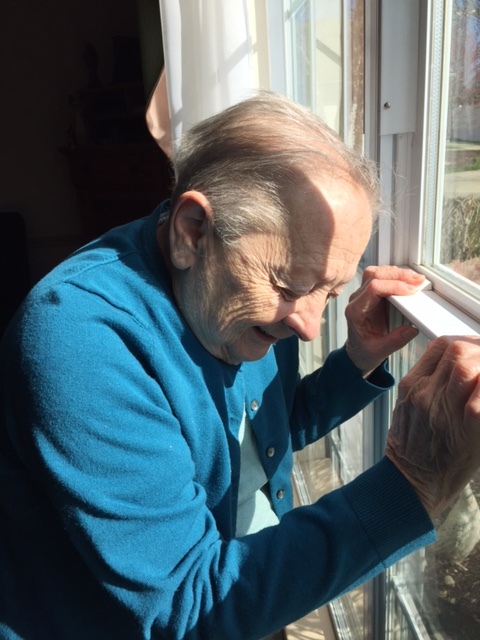 For Mom these days, her environment might comprise of a solitary moment, always fleeting. I often wonder, am I writing down a poem for Mom or me? If she had a moment where she returned from her dementia, could she read, interpret, and remember her life in just the way I portrayed? In just the way the image was once captured on Polaroid film? The word “commonplace” denotes ordinary. The word also contains a more explicit meaning as a place Mom and I, as her care partner and daughter, share, a place existing in time and space that I have in common with my mother. Her dementia is that common place. There, I root around for words to make sense of a world that only makes sense to her. There is little body of work that explains what happens when a family member or friend of someone experiencing dementia pens a poem to capture the essence of the moment. What happens inside the loved one’s heart and mind? Is the family member or care partner more relaxed? Does the work of sitting in silence or answering the endless questions become easier to bear? When writing poetry on how life unfolds slowly, only details are important. What is Mom wearing? Is it pink, what shade? Is it old, is it crooked? Does it sparkle? How perfect is poetry for that time of stillness when family and friends sit with loved ones, in the courtyard or watching Let’s Make a Deal or observe as a loved one pushes around mashed potatoes on the plate with a finger and thumb, or falls fast asleep in a chair. In that case, the poet never asks if a detail is relevant. Does it move the story along? The answer is always “yes”. The moment IS the story. My body of work includes dozens of poems that point to a singular instance related to my mother. When I string the poems together, when I peruse file names and read them, I view the long film strip of my mother’s life with dementia. My mother still thrives, after falls, seizures and another winter where we stared out windows and noted the lily-white fence in contrast to the deep blue unblemished sky. From those words, another poem will spring. Whatever scientists learn regarding physiological benefits of writing poetry about loved ones with dementia, the practice is a healing one. I carry the words into my day, knowing I lost a little piece of Mom, but preserved it in verse. that nod to welcome her. * Note: During a poetry circle, one member pointed out hellebores were poisonous and asked if that was the image I wanted to convey. There are many poisonous species. Some are used medicinally as well. I continued with the use of hellebore, as a harbinger of Spring, and also, as a testimony to how Mom has survived and is no longer afraid of that which can harm her. * Aequanimitas – definition: Imperturbability. (The calm in the storm). This is just amazing–the sweet spot of spring, you are. Hugs.